Baby has arrived! Always cherish and remember how little their piggies were with Pearhead’s babyprints tin. This adorable, do-it-yourself keepsake is easy to make and 100% baby safe. 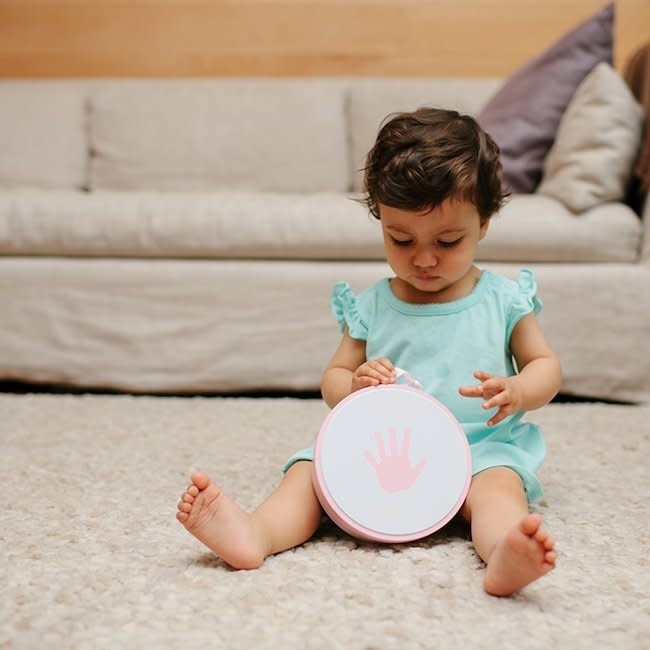 The babyprints tin comes in gray or pink with a package of clay, rolling pin, and easel to display once you’re finished. Everything is stored inside this precious tin, making this the perfect gift for baby for your shower! Best of all, the clay requires no mixing or baking! Simply knead the clay and roll it out on a piece of foil (not included). Press baby’s hand or foot in the clay gently but hard enough to create an impression. If you make a mistake- no problem! You can redo it as many times as you need until you get the perfect impression. Once finished making the print, use the tin to create a circle around your baby’s print and remove the excess clay. Let dry for 1-2 days outside of the tin. Once the clay is completely dry, place the clay back inside the tin for safe keeping. The easel is perfect for displaying in your baby's nursery or use the ribbon to hang around your home. Pearhead’s adorable babyprints tin is the perfect decoration for your home and the perfect keepsake to always cherish your little one’s piggies. Comes in grey or pink!